Looking for the Wednesday Wandering? Page back one. You certainly don’t want to miss how vegetable curry can lead to dystopias (or something like that). Then come back and join me and Alan for a look at the unique twists the British bring to their humo[u]r.
Remember! Bubonicon, New Mexico’s SF/F convention starts tomorrow… Hope to see some of you there! JANE: I rather talked my head off last time, so this time you get to start. Leeming then goes on to wage a rather twisted one man campaign of psychological warfare against the aliens. He is, of course, triumphant! JANE: Very amusing! Reminds me of some of the by-play Pratchett uses for his secret societies. Is this back and forth nonsense a British tradition? Just wondering. JANE: Thanks! I’m not familiar with The Goon Show, but I love a lot of the Monty Python troupe’s work. The first time I saw Monty Python and the Holy Grail, I didn’t register that most of the male roles (and many of the female) were played by the same six people. Later, when I started watching the television show and it clicked, I was even more impressed. I’d enjoyed the movie as a very funny riff off of Arthurian legend without even needing the gimmick of most of a very large “cast” actually being only six people. Have you read British author Tom Holt? His novel Expecting Someone Taller is screamingly funny and very smart at the same time. JANE: That was my reaction, too. The scene where Malcolm Fisher, heir to the Ring of the Niebelungs, goes to the library to find out exactly what it is he’s been carrying around and reads the summary of Wagner’s “Ring Cycle” is laugh out loud funny, especially in its analysis of the various personalities involved and the logical incongruities necessary to make the plot work. ALAN: I also loved Who’s Afraid Of Beowulf? An archeologist is excavating an ancient Viking burial ship. The ship is occupied by a horde of Viking heroes and a couple of rather odd spirits who while away the time playing a game called “Goblin’s Teeth” which appears to be a combination of chess, Monopoly, Scrabble and Snakes and Ladders. It’s very, very funny. His first several novels, which re-examined classical mythologies in a curiously British way, were all great fun. But then he seemed to fall into a bit of a rut and the novels became quite repetitive. I wasn’t very impressed with those. However he’s recently been writing a series of novels set in the modern day offices of J. W. Wells and Co., purveyors of magic (J. W. Wells, of course, is a Gilbert and Sullivan reference). I suppose you could describe the novels as office politics with magic and spells. They are a true return to form and they are very funny. JANE: Thanks for the tip. I’d had a similar reaction to later Holt, so it’s good to know he found a new playground. ALAN: Holt also has a sideline in historical novels which are also extremely funny. Olypmiad tells the story of how the Olympic Games might have started, way back in ancient Greece. And Song for Nero is the story of what happened to the Emperor Nero after he was deposed (no, he didn’t die…) I highly recommend these as well. JANE: I missed those, too. I’m hard to lure back to an author once I’ve been burnt. Thanks for letting me know about them. We seem to be on a British theme here. Are there any other British authors of humorous SF/F you enjoy? Most of Rankin’s novels are set in the London suburb of Brentford. Over the years Brentford has been invaded by aliens, infested with ancient evils, and rescued by God. JANE: I’m spotting a theme here – the books you seem to like sound very bizarre, and often surreal as well. ALAN: Again, I think you can blame this on the Goons. When you have just listened to a radio programme in which the players steal Dartmoor prison (leaving a cardboard replica behind so that nobody will notice), then sail the prison across the channel and fight a battle on the high seas against the Chateau D’if (“Curse these French prisons, they’re so much faster than ours!”), it becomes remarkably easy to accept the idea of a time travelling brussel sprout. JANE: I bet! I’d like to explore this further, but duty – in the form of my other life as a writer of fiction – calls. How about we continue this next time? This entry was posted on August 22, 2013 at 1:00 am and is filed under Thursday Tangents. You can follow any responses to this entry through the RSS 2.0 feed. You can leave a response, or trackback from your own site. I have that printing of Men, Martians and Machines. I believe it was the very first SF book I ever bought. Based on your and Alan’s enthusiasm, I shall put it on my reading shelf! I first heard of the Goon Show through reading the appendices to my copy of Partridge’s dictionary of slang, where it has an entire section dedicated to it. Seems to me that’s a clear testament to how iconic the show was. “Expecting Someone Taller” is a triple-threat book! It not only sends up Der Ring, it’s a shrewd psychoanalysis of Wotan as an anxiety-ridden control freak; plus, amazingly, it’s a touching, old-fashioned love story — as if Disney’s Ariel got it on with Arthur Dent! I love this assessment. I’m going to need to remember it for next time I’m recommending this book! “Men, Martians and Machines” is one of my favorites, too. In fact, Eric Frank Russell is one of my favorites. 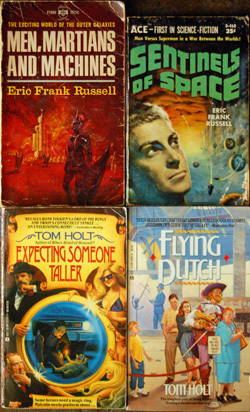 That “Sentinels of Space” pictured above was part of an ACE double (with the same cover) and one of the first SF paperbacks I ever read. I still have it; I need to pull it off the shelf and read it again. Russell also authored the serial (“Call Him Dead,” later printed as another ACE title, “Three from Space” I believe) I read in my first copies of Astounding. I have fond memories of Russell’s work — and for a long time, I hadn’t even known he was British. It just occured to me: unless i misremember one or the other, ERF modeled his Martians on the ones in War of the Worlds. I wonder how I missed that all these years? But Russell’s are much cuter! Because of this conversation, I’m currently reading _Men, Martians, and Machines_ . I’ve fallen in love with the Martians. much cuter – as I said earlier, they convinced me that the BEMs were the Better Guys. I think that ERF decided to tell us what the Martians were _really_ like. I’d put Douglas Adams’ Hitchhiker’s Guide to the Galaxy at the top of the list for funny SF books.